The Church of England believes that there are seven sacraments. Two of these Baptism and the Eucharist (Communion, Mass or the Lord’s Supper) are considered ‘Sacraments ordained of Christ in the Gospels’. The other five are ‘commonly called Sacraments but not to be counted as Sacraments of the Gospel’ and these are Confession and Absolution, Holy Matrimony, Confirmation, Ordination (also called Holy Orders) and Unction (anointing of the sick). In Anglicanism a different emphasis is placed on sacraments by the two wings of the Church – Anglo-Catholics and Evangelicals. A baptism - also called christening - in the Church of England is usually held in the parent's parish church. Most churches prefer the baby to be baptised during a regular Sunday service, often at the same time as other families. It is sometimes possible to have a private christening in a church of your choice. Many priests will want to see the parents for preparation meetings before the baptism especially if they are not regular church-goers. During the baptism service, the parents and godparents gather together with the baby and the priest around the church's font to make a series of declarations. They are required to declare, in unison, their belief in God, and that the child will be brought up following Jesus. The priest marks the sign of the cross on the baby's forehead, and will say: 'Christ claims you for his own. Receive the sign of his cross. Do not be ashamed to confess the faith of Christ crucified.' The priest then pours water on the child's head, symbolising the washing away of all sin to begin a new life with God, saying 'I baptise you in the name of the Father, and of the Son, and of the Holy Spirit.' If the ceremony is taking place during a normal service, the congregation may join in at this point, and a candle is lit symbolising Jesus as the light of the world. This is also called The Mass, Holy Communion or Lord’s Supper. ‘The Eucharist stands at the very heart of the life, worship and mission of the Christian Church. Under various names – Holy Communion, the Lord’s Supper, the Eucharist – this central action of the Christian community is celebrated by Anglicans week by week and day by day. In the Eucharist we commemorate sacramentally the sacrificial death and victorious resurrection of the Lord Jesus Christ. We are united with him through the power of the Holy Spirit. Receiving the blessed tokens of his Body and Blood, we truly participate in his risen life and offer ourselves to God as a living sacrifice, which is our reasonable service (Romans 12.1)’. Quoted from ‘The Eucharist sacrament of unity’. An occasional paper of the House of Bishops of the Church of England. This is the blessing of a union between a man and woman, acknowledging the presence and grace of God in the life of the couple. In marriage, the husband and wife seek God's blessing, and through the mediation of the priest, the prayer is answered. Although the couple are regarded as the ministers of the sacrament through their voluntary exchange of vows, the sacrament must be celebrated under the presidency of a clergyman, who witnesses and mediates the prayers. Matrimony was the last sacrament added, having arisen as a result of civil necessity in the Middle Ages in order to regularise relationships and legitimize children. 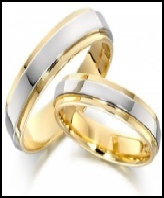 In many parts of the Anglican Communion, there is provision to bless civil marriages (on the understanding that a couple cannot be married twice). Although some Anglican Churches will marry divorced people, some will not or will require the permission of the bishop of the diocese. Ordination is the Church’s official recognition of a sense of calling to be a priest or a deacon. It gives someone the authority to do certain things in the name of God and the Church. It is also a sacrament - an outward sign of the grace of God, given to the deacon or priest through the laying-on of hands by the bishop, to enable them to fulfil their calling. There is no formal career path for priests, but there are lots of opportunities, including further education and training throughout their ministry. Some ordained people work full-time within the Church of England; others do it as part of their ongoing occupations. 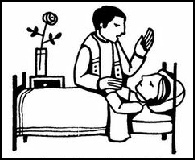 The Anointing of the Sick is an act of healing through prayer and sacrament, conveyed on both the sick and the dying; the latter is classically called Extreme Unction. The matter consists of laying on of hands and anointing with oil; while the form consists of prayers. In this sacrament, the priest acts as a mediator of Christ's grace and will frequently also administer the consecrated bread (and sometimes wine) as a part of the sacramental action. 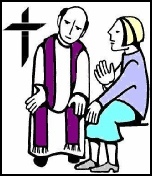 Anglicans can participate in confession following the traditional forms of confession practiced together by the church congregation or privately with only a priest as a witness. The practice of confession predates the Anglican Church and its form and procedure were inherited rather than invented.